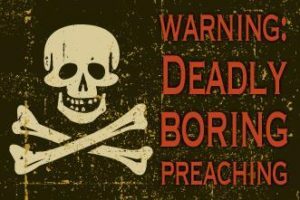 Lord save us from boring sermons! Boring sermons tend to be dry or trite. Dry sermons assert ideas about God but don’t connect with real life (“So What?” sermons). Trite sermons address life’s struggles, but stay on the surface and offer easy answers (“Yeah Right!” sermons). A good sermon connects the head with the heart, and adds depth to simplicity. Let me introduce myself. I’m Silvia Purdie, a Presbyterian Minister, these days to be found in Cashmere, Christchurch. Before that, Foxton Shannon Co-operating in the Horowhenua, then Milson Combined in Palmerston North. Before that, training in theology & Biblical studies, as you do, but far more of my life training for youth ministry, counselling, and playcentre. So I bring a people-focus to my ministry. I even managed to major in Pastoral Theology at Otago. This article invites you into an approach to crafting a sermon known as ‘pastoral preaching’. A sermon requires a way in to a piece of scripture. Bible texts, especially familiar ones, can feel laminated, double-glazed, impenetrable. To get beneath the gloss of the obvious (i.e. boring) we need words that jump out at us, we need the text to spark interesting questions for us. A pastoral approach makes some big assumptions about the Bible. 1) We’re not on our own here; the Holy Spirit’s job is to inspire the Scriptures, open them up and bring us fresh insights which we can share with others for the building up of the body of Christ. 2) All of Scripture is conversation, written by someone to someone. And it helps to know something about who wrote this bit, why, and to whom. A pastoral approach to preaching is interested in the people; the writer, the speaker, the actor, the observers, the hearers. You were probably taught to be cautious, to say things like “the author of”, to de-personalise scripture in case you get it wrong. Pastoral preaching pushes the other way, claiming a story-teller’s privilege to guess, to get the essence right even if you’re not 100% sure of the facts. 3) Most of Scripture is argument. It was written down because someone felt passionately enough to be bothered, because they were sufficiently opposed to other points of view. The problem for us is we only have one side of the argument. We have to imagine the opposition (why the folks in Corinth were critical of Paul, what the Pharisees would have said if you’d asked them about Jesus, what the locals would have thought of Nehemiah’s campaign). Finding the conflict in a text generates the best questions and pushes us to react. 4) Scripture is God in action. A good way to open up a text is to highlight all the verbs. Pick two verbs that clash or complement. Scripture tends to pack a lot of action into just one word; expand it in your imagination, make it into a full narrative. 5) Scripture reveals God’s heart. Centuries of male-dominated, left-brain preaching split emotion from the Word. Our job is to attend to the heart. Even the driest bits of Scripture contain emotion. Spot everything in your text that expresses feeling. Working this way with a piece of Scripture will generate lots of possibilities. Too many! The next step is to pick something. Choose a focus; maybe a verb, one aspect of the story, an emotion or contested idea. a) personal: how does this connect with me? What memories does this trigger? What do I actually care about here? c) theology: What ideas about God are relevant to my focus? … other scriptures and convictions that round out our understanding of the being, person and action of God. Finally, give it shape. The simplest structure for a sermon is ‘Bad News-Good News’. The first half of a sermon might open up some kind of issue, problem, dilemma, question or struggle, out of a Biblical text that also connects with our lives (especially your life). The second half might explore how God is at work to bring hope, transformation, truth, love … and invites your listeners to notice this action of God in their own lives. And style? Try writing shorter sentences than you usually do. Try adding in more evocative language, more detail for colour, texture, drama. Try sharing more intimately about yourself, especially what’s not neat and tidy. Try asking questions and inviting conversation. Try incorporating poetry, prayer, even silence. You can’t say everything in one sermon, and the hardest thing can be choosing what to not say. Working through a theological reflection process, with a particular emphasis on the ‘pastoral’ and relational, generates a depth of engagement which is gathered around a particular focus, one particular way in which God is at work to save and restore. Pastoral preaching, then, does not structure a sermon into 3 logical points, or finish with ‘Application’ (i.e. telling people what they ‘should’ do). It throws webs of connection between now and then, our lives and the lives of the people who wrote and received the Bible, so that their truth might become our truth. It makes space for feelings as well as beliefs, and values personal narrative as well as ideas. As we relate to the authors and actors in scripture, so our faith is enriched and points for action become clear. No chance of being boring!! Thanks, what a wonderful spiritual message I learnt today.